PHOTO: Haiti - APH Deputes donate One Million Gourdes check to Hospital Sainte Therese in Hinche. 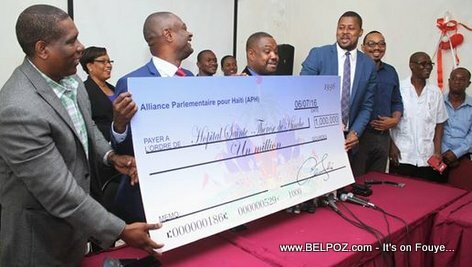 KREYOL: Haiti - Depute APH yo livre yon chek 1 Million Gourdes bay l'Hopital Sainte Therese de Hinche... Depute Fred Piton Kontan... Kisa ou panse de sa??? Hinche Depute Fred Piton and Delmas Depute Gary Bodeau proudly stand holding the check.